Installed today in Danbury, Essex. 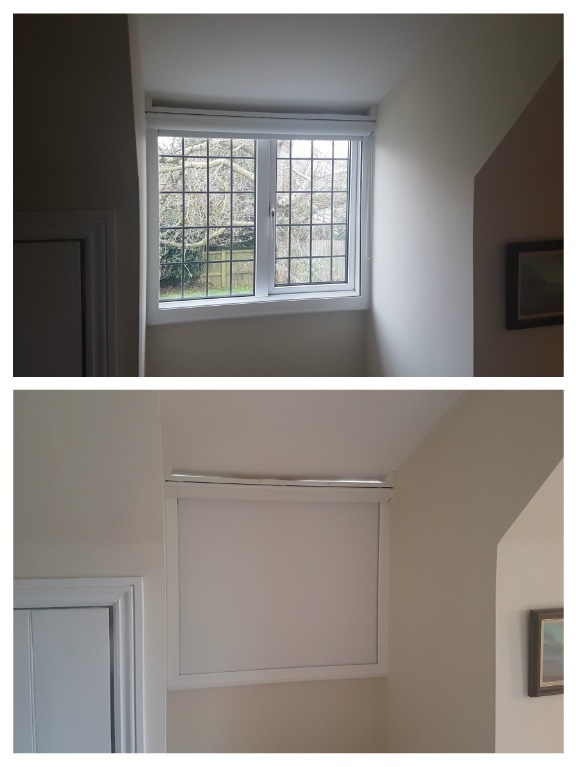 A “room darkening system” roller blind. Although resembling a full blackout blind in appearance, there are some subtle differences that don’t quite make it a full blackout – though you’d be hard pressed to notice. An enclosed cassette houses a standard chain operated roller blind. Side and bottom channels with soft brushes inside are installed and the blind runs inside of these. When fully closed, the blind offers a very good reduction in light. Perfect for shift workers or those that desire a near total dark room at night. Please note the light strip at the top of the blind is above our install and is a result of the age and construction of the dorma window. Our client was unaware of the size of the gap until the closure of the blind highlighted it. We were advised that they would rectify this themselves.